Teaching our children is a primary and ongoing task of joy for us. In the years before confirmation instruction, our children have a chance to learn Bible stories, memorize the Catechism, and serve their Savior in a number of ways: as acolytes during our worship services, as helpers in the “house-keeping” chores of the congregation, and in various special projects of their own. Provided by Pastor Metzger to members and friends of Old Zion, our Bible Study occurs at regular intervals throughout the year. Bible study generally focuses on a specific book in the bible during each session, involving discussion on how the scripture applies to our lives as Confessional Lutherans. Bible Study is planned to return in the fall (September) of 2019; focus, times, and locations TBD - please check back in the fall for updates! Old Zion Lutheran church is a member of the Evangelical Lutheran Conference and Ministerium (ELCM), a mission-minded church body which subscribes whole-heartedly to the Lutheran Confessions. The ELCM seeks to carry out the mission of the Church in coordination with her sister churches in Africa and Asia. For more information about the ELCM, and its missions, please click here. At Old Zion, we are acutely aware of the needs of the homeless and the disadvantaged, and we maintain an on-going program of collecting food (canned and non-perishable items) and clothing which we distribute to nearby shelters. The food we gather currently helps to supply Project H.O.M.E, on nearby Fairmount Street, and the Sunday Breakfast Rescue Mission, a nearby non-profit organization which ministers in the name of Christ to the needy. The clothing is distributed to several shelters both in Philadelphia and in New Jersey. You can visit the Sunday Breakfast site here to see how you can help as well! Our beautiful and historic organ is currently nearing the end of an extensive renovation process that has helped to restore much of its original sound. First, the pipes had to be cleaned and repaired after years of improper tuning techniques which made for changes in the timbre of the instrument. The winding has also been renovated with new bellows and air delivery system. As of May 2018, the majority of the organ has been reinstated and is in working use - work continues on a regular basis as the winding, pipe intonation, and actions are fine tuned and repaired. Plans for the future include a renovation/rebuild of the current console, installation of new tremolos and shades, and the possible addition of a new stop to replace a stop that had been removed. The pipes in the rear of the church (not pictured), also include an echo unit that was renovated, along with a new chime unit, thanks to the generous gifts of members. For specific historical information and a stop list, you can visit the organs listing at the Organ Historical Society by clicking here. 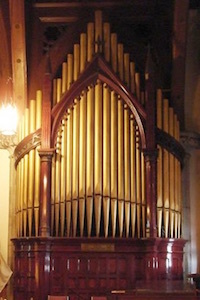 The Organ was originally built and installed in 1898 by King and Sons Organ Co as a mechanical tracker organ. In the early 1900's the organ was electrified. In the 1960's, the organ underwent its first major overhaul, when a new console was installed and moved back from the organ casing by Mudler Hunter Co. Our current organ tuner/builder is William DeGothsier. What happened to the Four Corners Mission? We are pleased to report that Pastor Krikiva has begun the process of limiting efforts for securing funding from abroad, as the Lutheran Church in Prague has grown to a point where it has become strong and self-supporting. We continue to support our brothers and sisters in Christ in the Czech Republic, and throughout the Eastern European states.